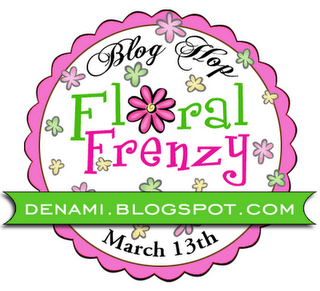 Welcome to the DeNami Floral Frenzy Blog Hop! So glad you could join us today! Don't know if you can see it very well but I scored 2 lines every inch and then lined up those cute little daisies in between! I colored each with a Copic marker and added a little bling center! If you are looking for a some Spring flower stamps, check THESE out! Lots of great stamps to pick from at DeNami! The next stop is Kristy's blog! I can't wait to see what she has in store for us! When: The blog hop starts on March 13 at 6 AM,PST. However, you have until March 14, 2011, 11:59pm PST, to leave comments on all the blogs (to be eligible for a prize). Extra Challenge: This blog hop filled SO quickly, so we thought we'd bring an additional opportunity for those who weren't able to get on the list, and also those blog hoppers who had additional floral projects to share. We will have a link widget on the blog hop post where you can upload additional floral creation(s). We'll choose one winner to be guaranteed a spot in the next blog hop AND they'll get to choose a few stamps of their choice! I hope you have a chance to make a Floral Frenzy creation of your own! Don't forget to link it up over at the DeNami blog! Thanks for coming by today! Hope you have a wonderful Sunday! THis is really cute. I like the font on the sentiment and the scored lines are a great detail. Like it - and your flowers are perfectly spaced. What a nice card. FABULOUS Laurie!!! Stunning CAS design and you totally can see the score lines! A perfect card to cheer someone up!!! Awesome use of flowers!!! What a sweet card! Someone will certainly have their day brightened when they receive it. Sweet card. Love the simplicity of it! I love the simplicity of your card. Very cute! I always look forward to your blog while hopping. :-) This card is simple yet stunning --- you make it look SO easy! What a great idea to make the score lines for the daisy placement! Good job! The scored lines are a perfect touch to your springy card! So cute..love love the sweetness of the colors! The Hang in There stamp is adorable. I have added that to my want list. Very simple, but makes a statement. Love your pink and black color combo! I could see your score lines the minute I looked at your card! I LOVE the DeNami font for this sentiment. Off to hop some more! :) Hopefully we can talk soon! Very sweet and simple! Black and pink ALWAYS work well together! Love the color combo on your card. My daughter would love this card. Hmm, I may just make one for her! Lovely CAS card! Love the bright cheerfulness! The black and white really draws the eye to the beautiful daisies. and those score lines are just the perfect touch! How cute! Those scored lines really make the card, just the perfect subtle detail. So glad to be able to hop with you! Nice and simple - great sentiment. Thanks for sharing! Cute card. What a great idea to score squares. Easy to line up images. Oh, so cute! Lovin this one. I'll bet this card is even more stunning in person. Love it! Super cute! LOVE the score lines-such a great texture addition! The black makes everything pop. So cute, Laurie! I can't see the scored lines, but I am sure that adds a perfect touch! 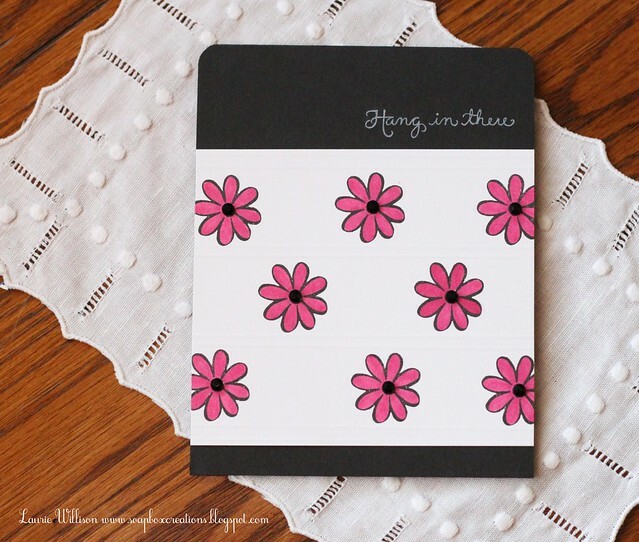 I love this card and I love how you scored it and put the daisies in a row perfectly! VERY CUTE!! Lovely card! I love the scoring detail! A fun and simple card! I love the sentiment...a good reminder for everyday! Love what the scoring adds. Well, hello there, stranger! I've missed your sudden disappearance from my blog. Hope life isn't giving you fits. I've been thinking about you. This card is so fun! LOVE the way white ink looks stamped on black! I, actually, tried a much simpler take this go around. Totally, going to leave CAS to you, from now on, though. LOL! It takes me so much longer than what I usually do! Hugs from your Kansas blog friend! Very pretty! Love the sentiment too. Love the color combo and the flowers. Superb!! You proved that less is more. This is lovely Laurie! I love the color scheme and those flowers! Cute! I love this card. The design of this card is delightful - thanks for sharing! the scored lines were awesome..
That's a great use of a small stamp with an embossed tile background. It's a beautiful outcome. Thank you for sharing your work with us. Laurie, Your card is simply adorable! Again, the daisy stamp is used again, this time with bling! Too cute, girl. I love the colors you selected. Such a fun and happy card, Laurie! I love the way you added scored lines- you are a scoring queen! This is darling and your scoring is genius Laurie! This was such a fun hop...so glad to be a part of it again! Beautiful CAS! Scoring is the perfect touch! What a perfect card...love the sentiment especially. I don't know if I have any 'hang in there' sentiments in my massive collection of stamps yet. I think you and I both know someone who could use this card. Love the pink and black. I can see the scoring, great idea. Laurie this is SO cute! I love the score lines and the colors are one of my favorite combinations!!! =) Thanks for sharing!! Laurie, LOVE the colors! LOVE the score lines! LOVE the bling! WONDERFUL card! Quite a few of us used those FAB daisies in all different ways! love this, so clean and simple. The bright color is perfect for the cheer up sentiment! I really love simple cards, and this one is perfect. Beautiful job! I really like the detail in the scored lines. Such a quick and easy card to make the looks amazing! Very pretty and the scored lines really add dimensions to those perfectly stamped daisies. I love daisies. Always a fan of CAS and this is terrific! SUPER CUTE! Lovin' the scored lines, the brightly colored daisies and the way you stamped the sentiment in white!!! Awesome work!!! This turned out so cute! Love that you kept it simple!! And, I love the colors too...have an unfinished one of my desk (for a week now) using those colors! Love em! I love this, so simple but so fab! !